While winter may not technically start until December 21, it sure feels like winter already here in Illinois! Winter in the Midwest brings gorgeous snowy landscapes, but it also brings frigid temperatures that can cause heaters to run constantly and drive up heating costs as well as grow your carbon footprint. You may think that since you rent an apartment there isn’t much you can do to combat the cold, but you’d be surprised just how much you can do even as a renter. Take a look at these 10 tips to winterize your apartment to see how many you want to implement this season. Obviously, keep your outside doors closed, but this also goes for large closets or other rooms that may not be heated. 2. Check your windows for drafts. If you feel any drafts give your property management a call to send a service associate out. A simple caulking may do the trick, or you may need to schedule a replacement. 3. Look for gaps at the bottom of your doors. If you think the door is installed improperly talk to your property management. Otherwise, an inexpensive draft stopper or even a rolled up towel will do the trick. This may be something you can get property management to take care of, or it may be best to just do it yourself. Either way, dust and other buildup can really hurt airflow so clean vents will do a lot to keep your heater running optimally. 5. Consider rearranging your furniture. Take a look at where the vents are located in the room. Is there anything blocking them? If so, move things around to promote air flow. Not only will this give you a way to show your personal style, it’ll add another layer between the warm inside and the cold windows. 7. Leave the curtains open throughout the day. We may not have all that many hours of sunlight in northeastern Illinois, but you should use what we do get. Let the sun in during the day to help heat the room naturally. We mentioned this in a previous blog about energy efficiency, but it’s worth mentioning again. If you turn the heat off, or at least way down, during the day when you’re not home you’ll quickly see your utilities bill go down. As you may know if you’ve ever spent time in the South versus the Southwest, damp air feels warmer. By using a humidifier you may be able to keep the thermostat at a lower temperature throughout the day, and you’ll fight static and spreading certain germs at the same time. 10. Adjust the ceiling fan (if you have one). We all learned in elementary science that heat rises. 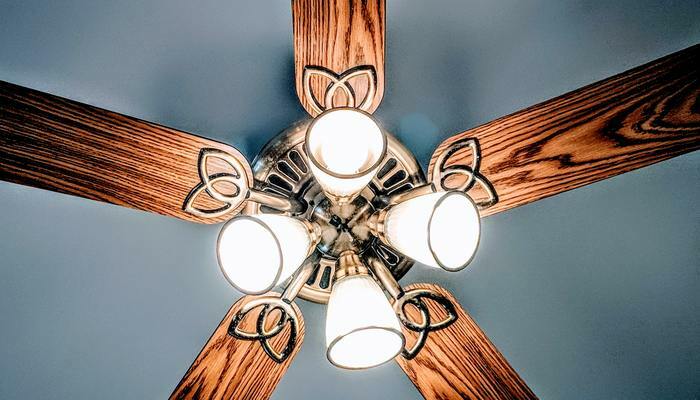 By running your ceiling fan in reverse you’ll push that warm air back down where you can enjoy it.